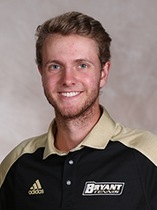 NEWPORT, RI – Bryant University redshirt junior Matt Kuhar and Union College sophomore Natalia Pezzucco have been named USTA Rhode Island’s College Tennis Players of the Year, for the 2017-18 school year. Kuhar, from Smithfield, RI, is getting his third Andy Chase/Gordie Ernst Award as the Ocean State’s top male player. Pezzucco, from Johnston, RI, is receiving the Jill Craybas Award, as the state’s female player of the year. The awards will be presented during an on-court ceremony at the Dell Technologies Hall of Fame Open, Wednesday, July 18 in Newport. The awards are presented by USTA Rhode Island to the male and the female college players of the year who are from the Ocean State, but not necessarily playing at a Rhode Island school. Matt Kuhar has played three season of college tennis and has earned three Chase-Ernst Awards. This season has been his best to-date, as he he led Coach Ron Gendron’s Bryant Bulldogs to a fifth consecutive North East Conference championship and NCAA Division 1 tournament berth. 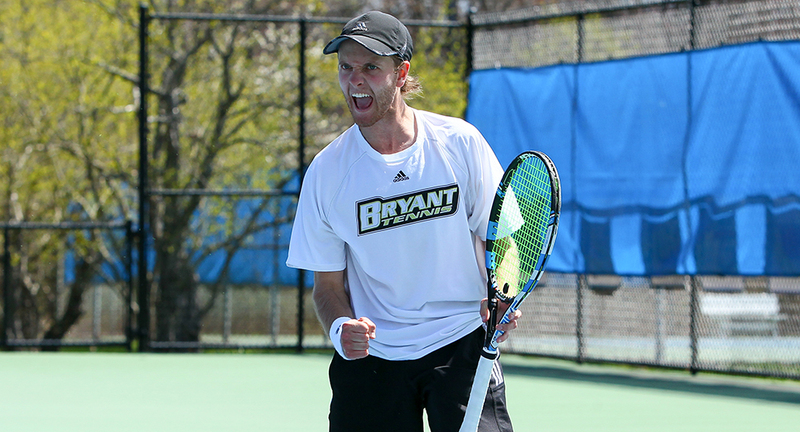 Kuhar was Bryant’s Male Athlete of the Year and the NEC Player of the Year for the second team. He was All-NEC First Team in singles and doubles for the third time. He was also the NEC Men’s Tennis Scholar-Athlete of the Year and a three-time NEC Player of the Week. Kuhar earned the first national ranking in program history at No. 121 and was regionally ranked No. 4. He was the ITA Northeast Most Improved Player. He finished the year with a 26-8 record in singles and 22-13 in doubles. In dual matches, he went 20-4 at No. 1 singles and 8-8 with Artur Jakubowski in doubles. He posted a nine-match winning streak during the year and was undefeated in NEC matches. A 2014 graduate from Smithfield High School, he captured three RIISL state singles championships and led the Sentinels to the state team title in 2013 and 2014. He also captured the first New Balance National High School Tournament singles championship in 2014. Matt is a Finance major and is the is the son of Mark and Mary Kuhar of Smithfield. Natalia Pezzucco had an outstanding season playing No. 1 singles and No. 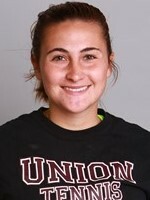 1 doubles for a Union College team which struggled to a 5-10 overall record. Pezzucco played the entire season for the Dutchwomen at the top singles spot, earning a 10-5 record, including a 4-4 mark in conference matches. Overall for the season, including tournament play, Pezzuco held a 19-8 singles record for the season. She won the singles consolation bracket at the ITA Northeast Regional Championship. Pezzucco earned Second Team All-Liberty League honors for singles, while Pezzuco and Megan Brown earned All-Liberty League Honorable Mention honors for doubles. Pezzucco was 18-6 overall in doubles, including 10-4 in dual matches. She was a Four-Time First-Team All-State player in high school, playing for the Wheeler School. An Electrical Engineering major, she is the daughter of Richard and Dawne Pezzucco of Johnston. JILL CRAYBAS – A native of East Greenwich, Craybas is the most successful tennis player in Rhode Island history. She was a RIISL high school state singles champion for the Lincoln School and captured the 1996 NCAA singles championship for the University of Florida, when she was the National College Player of the Year. She is the only player in NCAA history to be a member of Division I championship teams at two different schools (Texas and Florida). A two-time SEC Player of the Year, she finished her college career with a 124-18 record. A Florida Gator Hall of Famer, she played nearly 20 years on the WTA Tour. She won the 2002 Japan Open and five doubles titles on the main tour. She was ranked as high as #3 in the US and #41 in the world. A regular for the US Fed Cup team. Her most notable result came at Wimbledon in 2005, where she defeated Serena Williams and Marion Bartoli. ANDY CHASE – A native of Cumberland, Chase was the US National 16 & Under Hardcourt Singles Champion and a two-time national junior doubles champion. He won two RIILS state singles championships and team championship for Cumberland. He went on to play at Stanford University, where he was a teammate of John McEnroe. The Cardinal won three NCAA Division I team championships during his four years in Palo Alto. GORDIE ERNST – A native of Cranston, Ernst won four RIISL state singles championship and four doubles championships (three at Cranston East and one at Hendricken), including three with his brother, Bobby Ernst. He was 97-0 in his high school singles career. Ernst was a two-sport athlete at Brown University, was a NHL draft choice and briefly played on the pro tennis tour. Ernst is the head men’s and women’s tennis coach at Georgetown University, having previously coached at Penn and Northwestern. Among his current pupils are President Obama’s daughters. USTA RHODE ISLAND is the governing body of tennis in the state, and one of seven state associations that make up USTA New England, one of 17 sections in the country. Its mission is to promote and develop the growth of tennis in the Ocean State.